After leaving Lago Atitlán on the 8th, we drove to Chichicastenango for its famous Sunday market. Driving in “Chichi,” as everyone in Guatemala refers to Chichicastenango, is an…adventure. The streets are narrow, which is compounded by parked cars, trucks and buses. With a little help from bystanders we managed to get to our camping spot – the parking lot of the Mayan Inn, reputed to be the best hotel in town. Our first order of business was to get an assessment of our brakes. As you may recall, we over-heated them on the road (in name only) to Lago Atitlán. I asked a staff member of the hotel if he know of a good mechanic. About an hour later Tomas showed up. As it turned out the brakes were fine. The grease used by the Ford dealership in Oaxaca, Mexico was the source of the smoke. Tomas took everything apart, removed the suspect grease and replaced it with high temperature grease. Several hours work for about $47. We came to Chichi for the Sunday market which some say is the largest in Central America. We bought a couple of “hand made” items which we bargained hard for. Walking through the streets lined with stalls I was constantly greeted as “amigo.” I never knew I had so many friends in Chichi! We also visited the town’s famous cemetery – see photos below. When we left Chichi we drove north into an area of Guatemala known as “Little Switzerland.” It doesn’t look much like Switzerland to me, but it is mountainous. We spent the first night in Nebaj in a trash strewn hotel parking lot. Getting to our next destination, San Cristobal Verapaz was an adventure. 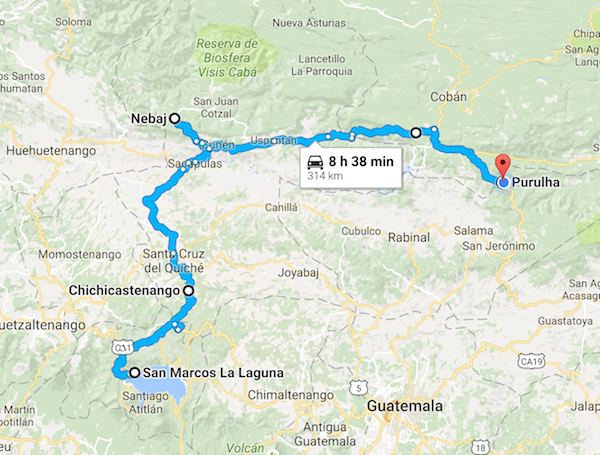 The distance between Nebaj and San Cristobal is just over 100 km. 25 km was unpaved and about half of that was a nightmare. The “road” was extremely rough. There were places where I wished we had a four wheel drive truck. We thought we would camp by the lake in San Cristobal but that turned out not to be possible. We found a hotel with a parking lot near the lake. The hotel’s manager couldn’t understand that we wanted to sleep in our camper so we paid for a room but didn’t use it. We wandered up to the town’s mercado and ate lunch in a simple comedor run by two giggling teen-aged girls. We met a man who spent several years working in Glendale, CA. In the market, Chris bought a skirt of the type worn by the Mayan women in the area. Our destination this morning was the Biotropo del Quetzal, a cloud forest reserve where we might be able to see the Resplendent Quetzal – the national bird of Guatemala. The iOverlander app indicated we could camp at the reserve. We found out we couldn’t. We stopped at a nearby hotel to ask if we could stay in the parking lot for the night. Yes, for $20. So we backtracked to the town of Purulhá and found the Montebello Hotel. We’re at the hotel because today is the first day in our trip when it has rained before noon. The weather forecast indicated the rain would taper off in the early afternoon, but that didn’t happen. We’re hoping the rain will stop so that we can hike in the reserve tomorrow. This will be our last stop before crossing the border into Honduras.